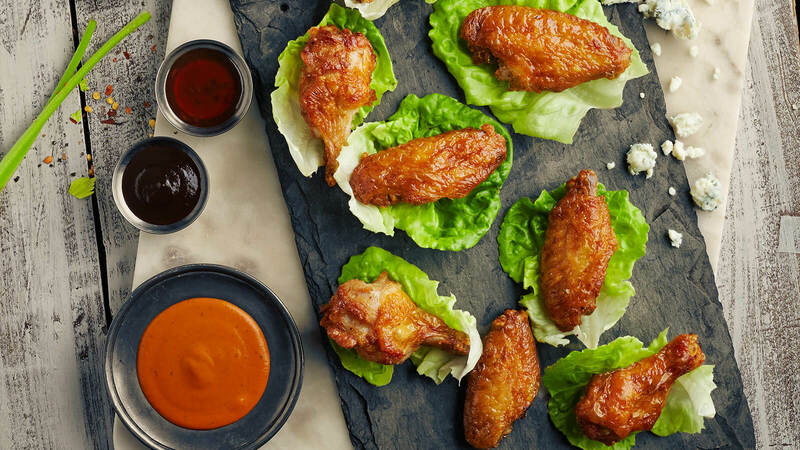 A sure crowd-pleaser, our Wing Platters are available in these mouthwatering flavors: Buffalo, Teriyaki, Honey BBQ, Spicy Korean, Garlic Parmesan or Natural. Served with blue cheese or buttermilk ranch dressing. Reheating required. Reheating Instructions: Remove from tray, place on a baking sheet and heat in a 350°F preheated oven for 10 to 20 minutes or until internal temperature of 165°F. Please include a comment in Step 1 of Checkout indicating which flavors you would like to have in your platter.